Temporary shelter made from new wood lattice, salvaged wood patio umbrella frame, and salvaged bed linens. Inspired by the Mongolian ger (yurt), this shelter was born when a neighbor cast out a patio umbrella that made a perfect roof frame. In the same scrap pile we found an old doorway frame for the portal and bed linens for the covering. 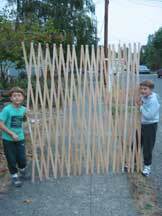 For the accordion frame we had to buy lattice slats at the lumberyard. 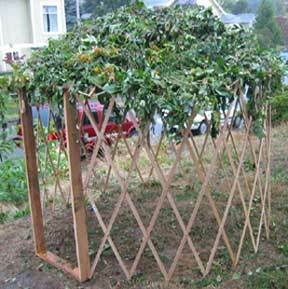 The first circular sukkah we have built, it was convivial to group dining inside. Heavy winds uprooted the sukkah twice during the week, which explains why Mongolian ger are more squat in proportion. Materials cost about $50 and construction took one day. 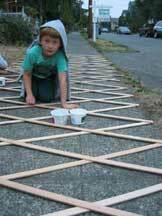 The sukkah was dismantled at the end of the holiday week and relocated to a neighbor's yard where it served as a playhouse for a year.